It’s like a warm breeze, blowing from a direction you can’t quite pinpoint. You look up, but you can’t see the trees swaying. Maybe it’s not a wind. Maybe it’s the Toyota MR2. A space sailor, on interstellar currents, looking down on this fair Earth, radiant and blue. A tear. Pride, perhaps. Pain or joy, it is impossible to tell. Incomparable vibrations blend the states of matter around the craft. It collides, almost wholly vaporized. An arm reaches forth from the crater. Maybe it’s a trickster spirit from a ghoul planet across the galaxy. Maybe it’s a scientific envoy come to free us from our mind prisons. Maybe it’s the Toyota MR2. You awake in the dark. The ceiling ripples, and a hum comes from below. You sense that there is something stirring thousands of miles away, in the deep. Two lights flip up in the inky depths. Maybe it’s a nightmare. Maybe it’s a calling from an undiscovered squid. Maybe it’s a collective spirit of madness materializing at humanity’s most distant reaches, wildly undulating in stirring discord, a manifestation of unsure progress blindly pulling forth, reaching up unknowing as that beneath it crumbles. Maybe it’s the Toyota MR2. Vigorous engine sounds! Wild hand-foot-clutch motions! Spinning wheels of great fear and imposition! 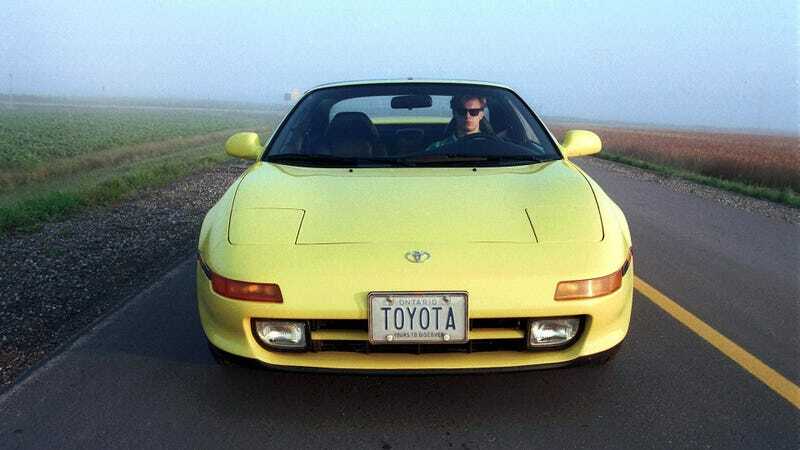 These glimpses, ghost imprints of a wandering eye, are the Toyota MR-2. It is a shell, a car-case, a vehicle that should not be, a curse, a celebration, a success, a failure. Or to you, it could be.